Summer heat got you down? If you’re looking for a fun way to cool off, you don’t have to be a kid to enjoy these cool, refreshing, and healthy popsicles! These aren’t your typical store-bought popsicles full of artificial coloring and flavorings. In fact, these summer treats are actually good for you! This quick and easy recipe from Thrive Market packs a healthy punch of antioxidants, fiber, and protein – all in a delicious and cool little package. Unlike the simple frozen juice popsicles your kids probably enjoy, these have a bit of an adult twist, with blueberries simmered with balsamic vinegar, honey, black pepper, and sea salt. Yum! Stay cool by the pool with these delicious and healthy summer treats. 1.) Melt coconut oil in a small saucepan over medium heat. Add in blueberries and sauté to blister in the oil. Add in 1 tablespoon honey, coconut sugar, and balsamic vinegar. Stir and let reduce slightly. Stir in black pepper and salt. Set aside to let cool. 2.) In a large bowl, mix together coconut milk, chia seeds, 1/4 cup honey, and vanilla. 3.) Divide blueberries and their juices between popsicle molds. 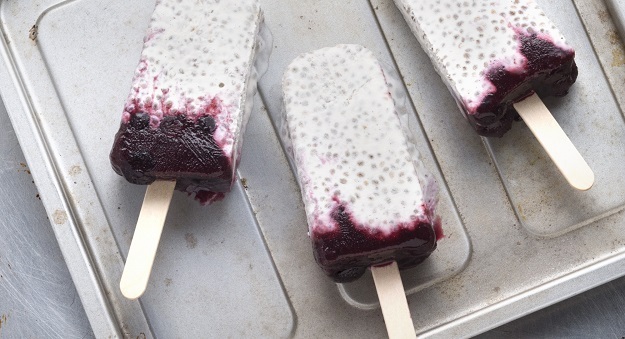 Top with chia mixture, place in popsicle sticks and freeze for at least 6 hours. 4.) To unmold popsicles, run under warm water for 5 to 10 seconds before pulling them out of their molds.